The brand identity of a digital product or service is becoming an increasingly important part of the projects we're working on at Made by Many. As an interaction designer it's my job to construct the essential elements that will form a brand and apply it to a digital product. However visual tools are not the only elements I have to consider when creating a brand. An approach we’ve tried recently is to iterate an editorial voice as we learnt more about users, and then apply a visual brand. Since last summer, we’ve been working with Belgian state broadcaster VRT, supporting them to reconnect with 'generation YouTube', including a prototype website called Sambal. Sambal is an experiment and a learning vehicle; for VRT its importance is in developing new product strategy and design process and learning about a new audience. 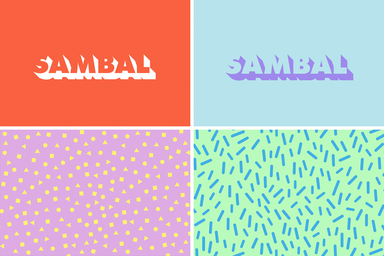 Sambal is aimed at Flemish people in their late teens/early twenties with an interest in popular culture and diverse topics not served by mainstream news outlets. VRT already has a well-respected online news outlet in Deredactie, but had no coverage aimed solely at a younger demographic that was turned off by the traditional news on TV. I participated in our customer development process, and helping to run test sessions face-to-face with users gave me a deeper sense of what the audience connected with. I was able to learn how digitally native Flemish young people are, hearing first-hand, “We have the internet, so we don't use TV and we don't miss it” and, “all the stuff I want to know is through Facebook”. It’s important for me as a designer not to be too distant from testing and hear directly from users, especially when it’s an international client in a market I don’t have personal knowledge of. From the user-testing sessions, we began developing an MVP that would eventually develop into Sambal. This early iteration was deliberately designed with a ‘vanilla’ look; this gave the editorial team a neutral foundation to test different types of content and establish what resonated most with the desired audience. The editors developed a production process, publishing to a test audience covering hot stories from the web in the categories of Beautiful, Entertainment, Serious, LOL, Amazing, Geeky. To create a solid brand, a consistent voice has to run through everything; copy, image choices, tweets, all the way to the type choices and the transitions on a page load. As Sean Perkins (Founder of North) states in a recent Adrian Shaughnessy article, “The brand is the whole experience, the service, product, personality and expression and I can't see how people claim to do the branding, the total experience.” This sums up how much creating a brand exists beyond just a logo, especially for editorial platforms. To strike a chord with a notoriously tricky young audience and remain user-focused, creating something new in this space requires the whole team to be working from an honest and authentic place. When tackling the look and feel of Sambal, I took some inspiration from content that the demographic absorbed on a daily basis and would establish Sambal was coming from the same place. This included fashion and identity design being shared on tumblr, early 90s patterns, animated gifs and music videos. Anything I felt that summed up the vibrancy and playful nature of the Sambal voice. To counterbalance this lightness, I used Futura and Meta Serif to give the content some underlying weight, which was important in helping Sambal have the flexibility to cover more serious topics. 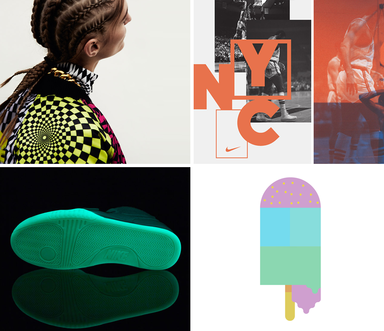 The type of content being produced was designed to be shareable and meant the identity still had to be felt when absorbed directly on different platforms such as Facebook, Vimeo and Snapchat. Sambal is still being iterated and tested. The editors continue to develop their voice and take on feedback from the audience, about how and where they want their news. But that's the point of the process: to keep learning and keep moving forward, apace with YouTube Generation.